This book offers a classic survey of modern English poetry from the new tradition established by Yeats in the 1890s through to Eliot, including a reassessment of the Georgians and the influence of Pound. Reading T. S. Eliot and reading about T. S. Eliot were equally formative experiences for my generation. 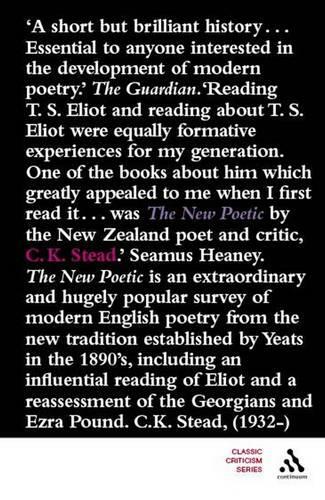 One of the books about him which greatly appealed to me when I first read it...was "The New Poetic" by the New Zealand poet and critic, C. K. Stead.